Deep creek H.S. is still my favorite. But Gold strike is much closer and my second favorite. I am sorry to have not posted sooner, but I have been very busy lately. The trail to Gold Strike is "closed during construction." So the sign says. But during the weekend there is no construction as before. People have noticed this and are parking in the old parking place and further down the canyon also. This Sunday about 25-35 visitors showed up. @ 2/3 parked in the old parking canyon. The others came from the river. Most of my time at the springs was spent digging the rocks out of the cave in the upper pool. I have gotten about 90% of the rocks out now and you can swim all of the way through to the other side again. The big pool was cleaned by locals yesterday. They pulled the plug and drained it to get more rocks out and keep the scum factor low. 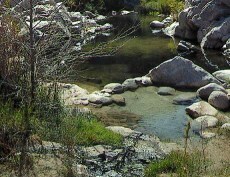 Yesterday @ noon I went to Arizona (Ringbolt) hot springs with a friend. As I have not been there in over a month. And my friend did not want to encounter snakes at GSHS as I have lately, more about snakes later. At Arizona HS there were a lot of campers and canoes. The sand bags that make up the pools were a mess leaking and the pools were only about 1+1/2 foot deep. A 7 year old boy helped me fix the pool next to the ladder back to soakable again. His parents took alot of pictures and he was very proud of his accomplishment. They were from Conneticut and were going on the dam tour today. The river was higher than usual. Last week me and several hikeing friends saw tree snakes in four days. Saturday a week ago my friend and his over weight wife were dropped off at the old parking lot and hiked in that way. While me and several others hiked in at the next canyon over, where there is 4x4 access. I call this canyon No name canyon, because I found this canyon on my Topo map feature on my computer and it said "no name." Any way, as we hiked out me and my friend saw and took pictures of a four foot Rattle snake. We watched him @ 25 minuets and then left. He had ten rattles. When we went to pick up my over weight friends they had seen a similar snake. On Wednesday as a friend and I went back to dig the rocks out of the pools again we saw and took pictures of another snake who was skinnier than the other snake and had fewer rattles. I suppose these snakes were pushed out of their homes by the construction. Or maybe they are just more active because of all this good weather. Be aware! I hope this helps with your trip. Go @ 2 hundred yards past Hacienda Hotel Casino from Vegas and turn right were there is a break in the gaurd rail. Go underneath the new bridge. When the road comes to a T turn right and check your odometer. Go exactly one mile. A small road turns left. You can park @ 4 cars at the flat spot there. Do not block the road in. If you do not have 4x4 park here. If you have 4x4 and high clearance turn left and go @ 100 feet to the top of the hill. It is @ 100 yards to a almost flat spot near the canyon wash. Go down hill. It is 1.2 miles to Gold stike canyon. Turn right and keep going down hill, go another 1.2 miles to the pools. I posted these directions on another web site. Soak.net go to Nevada and then look at the Gold Strike link. Soon I will contact the Park police and ask about the legality of parking at the old parking spot when there is no construction. Happy soaking and glad too help!